I cannot say enough about American Apparel colors. The first two I bought were Peacock featured here and the Lopez Canyon. Before American Apparel my collection consisted of lots of metallics, frosts, glittery, flat toned polishes. Then I found my soul with these colors. They speak to my style and how I would describe myself in colors. For whatever mood I'm in I can match it to an AA color. So here is my version of a speckled egg. My little cousin said that's what the ring finger looked like so I felt it appropriate to name this mani after her. Thoughts? Feelings? Concerns? 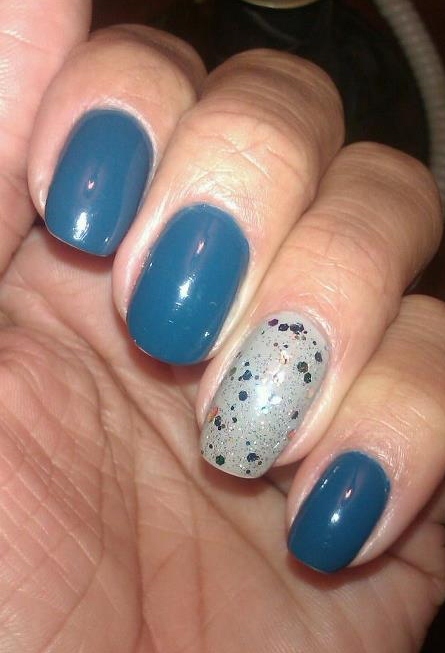 American Apparel "Peacock" accent nail Old Navy "Tight Taupe" with Confetti "Tazmanian Devil"